So while reading the Financial Times weekend edition, I came across their food column describing the foods that were traditionally served in rural France to all those toiling for the wine harvest. It sounded so idyllic — recreating the “I Love Lucy” sketch to crush the grapes beneath my feet while being fed leg of lamb and this rhubarb cake. When the reverie was over, I recognized that being out in the fields in the hot September sun was probably not something I would have enjoyed, but it didn’t stop me from making this delicious rhubarb cake in my air conditioned apartment. When I first read this, I thought, “alas” the rhubarbs have packed up and moved on since they’re more of an early summer kind of act. However, I then ran across to the grocery store, and lo and behold, and entire stack of rhubarb stems already trimmed of the poisonous leaves (who knew?). My husband laughed with me as I hoarded all of the rhubarb stalks in sight, and I’m pretty sure I can now confidently say that I cleaned out the last of the rhubarb. When making the batter, I thought — surely I just didn’t measure all the grams out correctly (while also thinking, why do I subscribe to a British newspaper with all their grams!!!) since the batter was so small in volume, and barely covered my 9″ springform pan (or the 23ish cm pan as the recipe calls for). 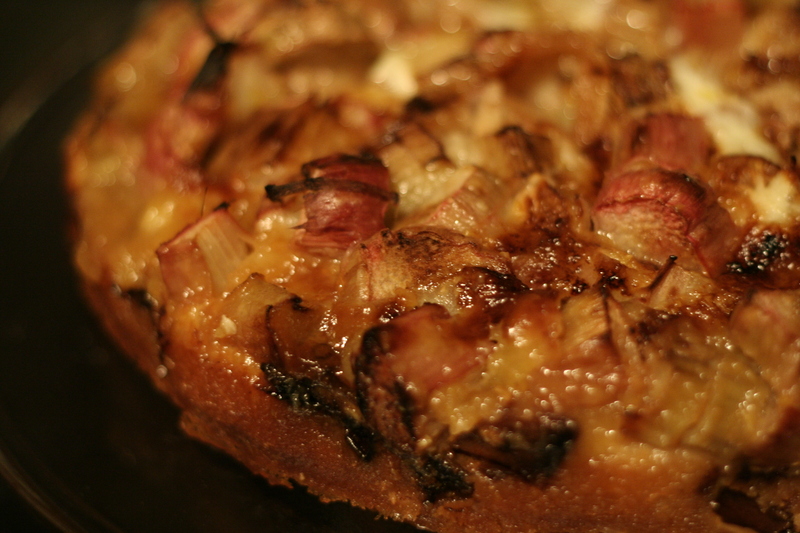 However, rest assured, it is just the right amount, and the result will be a wonderful cake where the batter rises and the rhubarb falls to blend into each other with a wonderful, rustic simplicity. This recipe is supposedly from the Rhône region of France, known for its dry and delectable wines (think Viognier, Cinsault, Carignan). Preheat the oven to 445-450 degrees F. Mix all the ingredients, except the fruit, together in a bowl to make quite a soft, almost runny, dough. Butter a 9″ round springform tin. Sprinkle with flour. Spread the mixture into it. Place the rhubarb pieces on top of the mixture. It is a little difficult to be accurate about the amount of rhubarb, which can give off a lot of liquid — but bear in mind it is a very soft cake. 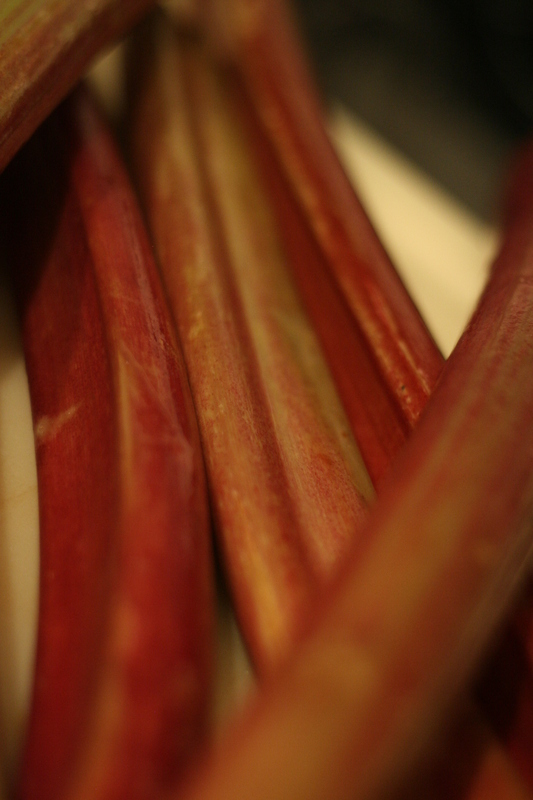 The sharpness of the rhubarb will be offset by the caramel. Bake in the preheated oven for about 30 minutes, until golden. (It will rise a little.) Meanwhile, prepare the caramel sauce. Melt the sugar and butter together in a small pan. Remove from the heat, cool a little, then stir in the egg. When you take the cake out of the oven, pour this sauce over it. Put it under a hot grill for two minutes or until the sauce has caramelized. Watch it carefully, as it burns easily. Leave the cake to cool. It may be eaten warm or cold. Note: I used a scale and measured everything out in grams, but I included the exact conversion to ounces here.